I feel like I need to begin this review by letting you know that I think Nina George is a phenomenal writer. Her book, The Little Paris Bookshop, was far and away one of my favorite books of last year. So, when I saw that she had a new book coming out, I was super excited. Unfortunately, I think some of my excitement may have led to some disappointment. 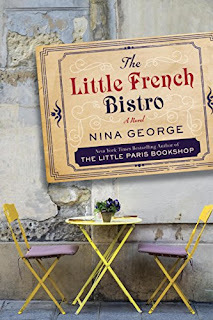 For me, The Little French Bistro was a slow read, and one that I struggled to get into. I generally have a rule that if you don't "get into" a book, you put it aside because there are far too many books to spend time on one you are struggling on. However, this author is a beautiful writer. So, even though it moved significantly slower than her previous book, I was still so in love with her flowery sentences and evocative language that I stuck it out. With that being said, if you are a fan of books featuring an older demographic and women come into their own late in life, you will most likely enjoy this book. George is an excellent writer and I probably would have liked this book more if I had not read her previous work and had such high hopes. It might also just be because I am in summer mindset and needing some beach reads, and this one did not fit in this category.